Since we last saw our favorite Viking, Hiccup (Jay Baruchel, THE SORCERER’S APPRENTICE), he has become the chief of Berk, his home village where humans and dragons now co-exist. But not everyone loves the idea of dragons roaming free. Cruel, devious Grimmel (F. Murray Abraham, AMADEUS) plots an attack on Berk that puts Hiccup’s home at risk and endangers everyone closest to him, including his best friend, Toothless, the Night Fury dragon. 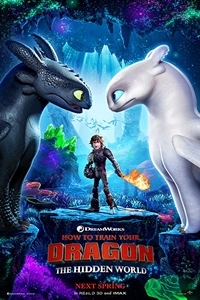 With the help of their friends, family, and a mysterious new Light Fury dragon (who we’re pretty sure Toothless likes… as in like-likes), Hiccup and Toothless will set out to fight Grimmel and track down a land that some believe only exists in myth: the Hidden World, home of all dragons.